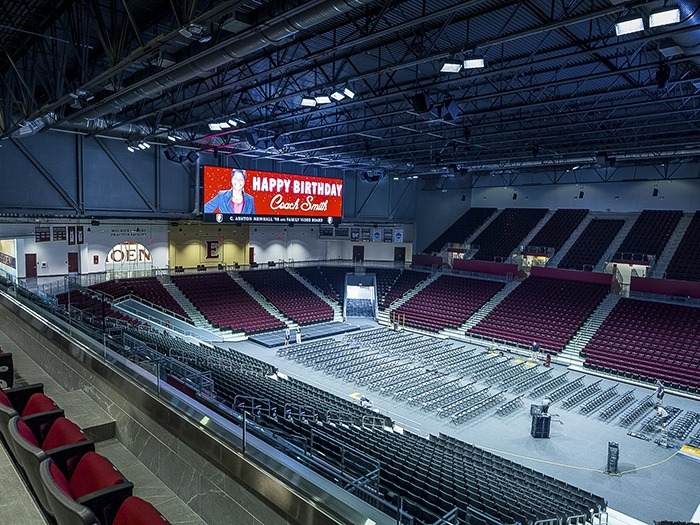 Elon University has recently opened the all-new Schar Centre which serves as the new home for Elon Phoenix basketball and volleyball and a centre for major campus events. Audio & Light, designed and installed the AV systems for this beautiful and extensive new facility, including a state-of-the-art sound system in the 160,000 square-foot, 5,100-seat arena that relies on Linea Research power amplifiers. To ensure that quality, Brian designed a Dante system featuring high-end Fulcrum Acoustic loudspeakers driven by Linea Research 88C10 and 44C20 power amplifiers and networked with Symetrix Edge DSPs. Five 8-channel Linea Research 88C10 power amplifiers drive the 40 channels of mains and fills, while a pair of 4-channel Linea Research 44C20 amps drive the 8 subwoofers. A sixth Linea Research 88C10 is kept in the rack, unpowered, as an emergency spare.